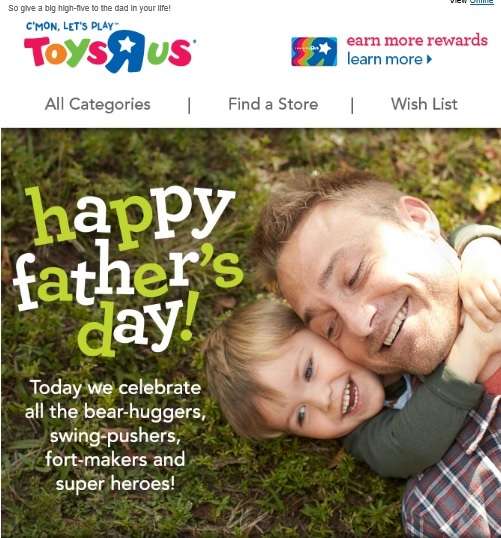 Sure, this featured email promo from Toys”R”Us is a gratuitous Father’s Day message which ran this past June 21, likely the lone time during the year you’ll see a dad-specific message from the giant toy retailer. Today, however, that’s not of our concern. Take another look at the ad. The copy is creative. The design is clean. The look is simple. And, whoa, is that a child is hugging a dad? That act – the hug – is the kind of thing normally unassociated with the stiff, rigid, unexpressive, stereotypical father, right? 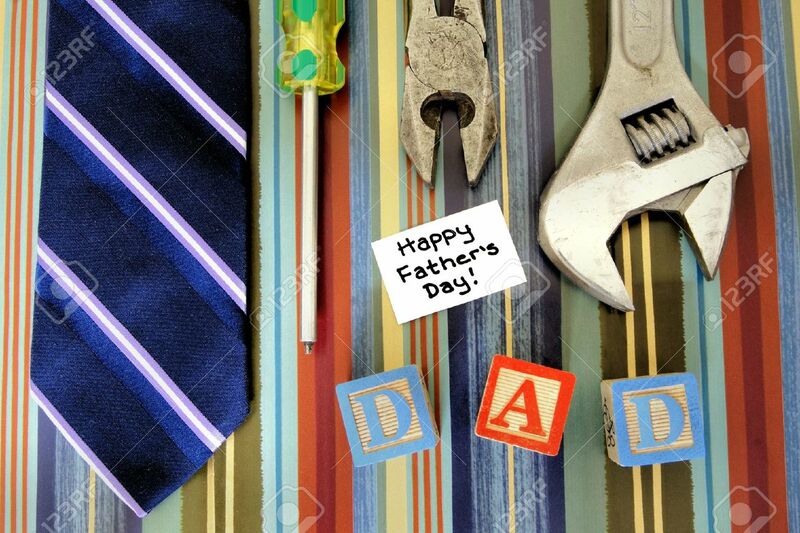 So often we typically see hugs and kisses for mom at Mother’s Day, and a lot of tools and neckties for dad on Father’s Day. It’s unfair labeling where we’ve been conditioned by companies to think that only moms are the caring, nurturing ones at home, while dad’s true love must be work since he’s there most of the day, hence the tie. So when it comes to expressions toward dad, it’s less common to see hugs in advertisements. You might see hand holding or a shoulder ride at best, but a hug for dad is rare in ads. We applaud the creative team at Toys”R”Us for presenting what others can’t: a deep tenderness and affection toward dad. This is exactly the kind of move that tells dads, “We know you’re out there, and we value you; we’re talking to you, and we want you as customers.” It presents dads in a caring light as the nurturers they really are, and speaks to them through solid marketing messages that evoke emotion. Nice work Toys”R”Us, and we look forward to seeing repeat performances not just in June, but throughout the year. That’s because rumor has it, more than one dad has visited all of your 865 stores before. 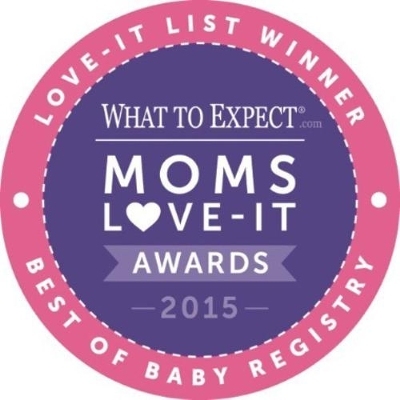 If WhatToExpect.com truly offers information, as it says, on “pregnancy and parenting,” then why is it singling out one gender and hosting the annual “Moms Love-It” Awards? It’s confusing how things ended up this way. It’s admirable that the site uses the term “parent” when speaking about Murkoff’s original ambition. Murkoff seems like a fantastic, dynamic, successful woman on a mission to improve lives. However, somewhere along the way, parent was replaced with mom, leaving dad as the one parent who apparently isn’t on equal footing. It’s a bias we’ve seen elsewhere and remains as unfortunate mistreatment. And now with the relatively new “Moms Love-It” Awards (launched 2013), it makes expecting fathers feel like they simply don’t matter, underscored by the various award-winning companies from whom expectant dads everywhere will be purchasing their baby needs. Yes, indeed, dads shop too. What’s more, this is again yet another example of a website offering a “For Mom” section, with dad information buried elsewhere. Even the “Military Mom” section offers a one-sided look that ignores fathers. Why not offer a “For Dad” section with equal prominence instead of burying it under “More”? 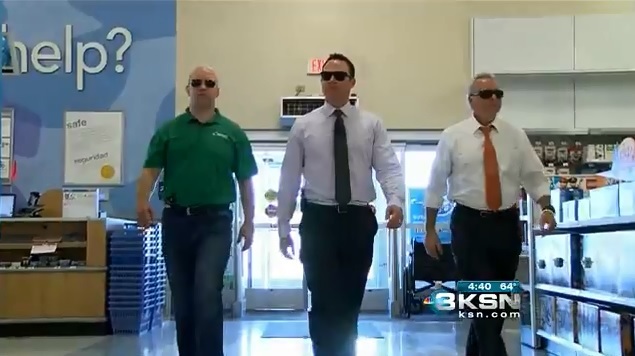 How about a “Military Dad” section? 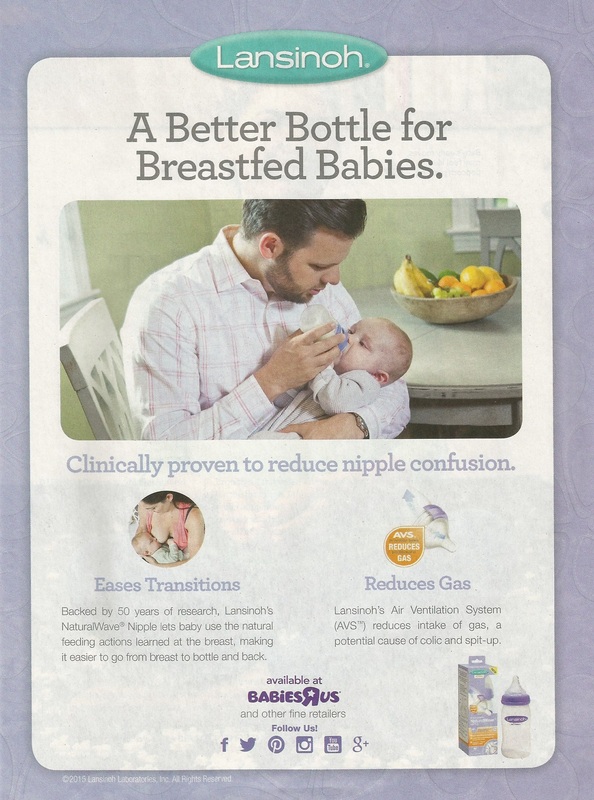 If marketers so often like to falsely earmark dad as the parent who isn’t as smart when it comes to babies or who isn’t as involved, wouldn’t those fallacies be all the more impetus to offer solid information to fathers? Everyone wants to be treated with respect and dignity, but how can dads find it here? Of course, dads aren’t actually carrying the baby, but that doesn’t mean they’re less important, or don’t matter to the pregnancy – they’re totally, equally important to the child. And the “Moms Love-It” Awards are only two years old. 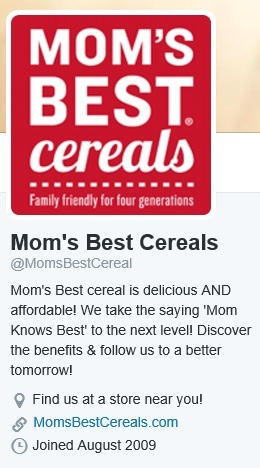 How about renaming them the “Parents Love-It” Awards before another company beats them to it? 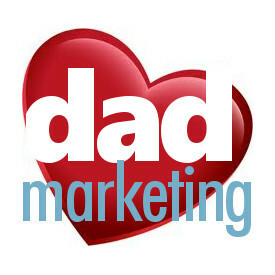 Dads have a lot of options when it comes to parenting information, and those companies who choose to actively engage with them will be the true award winners.